'Tis the season to make candy for sharing or just enjoying at home. 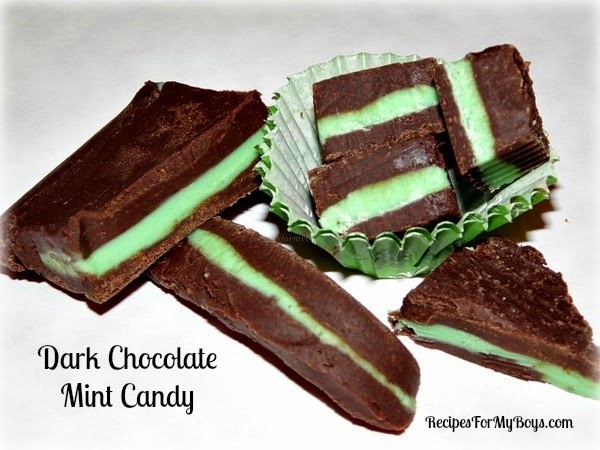 If you like chocolate mint candy as much as the boys and I do, you will LOVE this Dark Chocolate Mint Candy....it is definitely a keeper! My boys decided to get their own candy. It looked much worse after I took this picture. :) It was definitely approved of! The boys compared it to Junior Mints...quite a complement! They told me I need to make more and put it in brownies, candy and especially, lunch boxes! Just a heads up: I made the candy on a baking sheet because, frankly, I found it hard to spread and difficult to manage in the pan. Perhaps a smaller utensil would have helped, instead of the long decorating spatula I used. *All almond bark can be used in place of white chocolate and is what the recipe called from the Christmas Cookbook I found it in. I'll see if I can find a link to the cookbook and share. Melt dark chocolate with 1 cup condensed milk. Stir in vanilla. Spread in wax paper lined 8x8 pan (or on baking sheet). Place in refrigerator to chill (about 15 minutes). Keep remaining chocolate at room temperature. Melt white chocolate, bark and remaining condensed milk. Stir in peppermint and green food coloring, if using. Spread over chilled dark chocolate. Chill 15 minutes. Spread remaining chocolate (reheat if needed according to directions on bag or box) over mint layer. Place back in refrigerator 2 hours to overnight. Cut into pieces. Enjoy!